As a young boy playing in the maze of narrow walkways, small squares, and canals that make up this ancient lagoon city of Venice, Italy, Roberto's imagination was captured by the story of Pinocchio, and while still a teenager he began making puppets and marionettes. Over the next twenty-odd years his marionettes evolved into the variety of characters you see presented on this website. Each workday you will find him at work in his small shop in Venice, in the same neighborhood he grew up in. Today, Marionettes in Venice is a family affair: His sister, Manuella, a professional tailor and creator of Venetian Carnival Costumes, makes the custom clothes for each marionette. 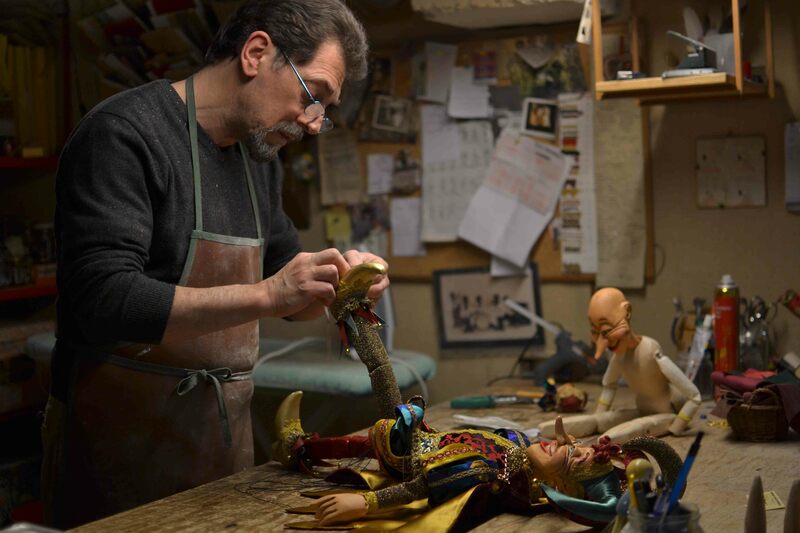 As a Venetian artisan, Roberto's marionettes have been traditionally sold in select stores here in Venice. However, now you can now order your favorite marionette from this website and have it sent to you directly from his shop. By the way, if you ever make it to Venice stop by and say hi. Our Marionettes are fully working marionettes: click the photo at left to see a sample of both control crosses. The marionettes are made of traditional material in the traditional manner, the bodies are made of wood and the feet, head, and feet are made of a wood pulp mixture and hand painted one at a time. Hand made wooden marionettes from Venice, Italy: Venetian, Commedia dell'Arte, Literature, and wooden Pinocchio too.